Remember this little apron? In the past week, I finally finished the patterns which had been ‘almost finished’ for ages. Many weeks ago already, I created four new aprons from some beautiful Cotton + Steel canvasses. Two grey ones for me, and two green ones for a friend. Both in theme and material, these fabrics are just perfect for a kitchen apron. They fabrics were sent to me by the lovely Frances from Miss Matatabi, who also carries it in purple. The aprons are quick and easy to create, but most of all, they are super handy. They have one long strap which runs through tunnels in the arm scyes, so that they are super easy to put on and adjust. Below is a detailed tutorial for the aprons, which includes a free pattern. But first: let’s talk free fabrics! Please use the widget below to take your chance! The measurements of the finished aprons are indicated below. The little chef pattern will be perfect for a child up until the age of around four; for older kids, the pattern can easily be lengthened at the bottom. If you’d like to widen it, simply cut the pattern away from the fold (e.g., cutting it 1 cm away from the fold, makes the apron 2 cm wider). 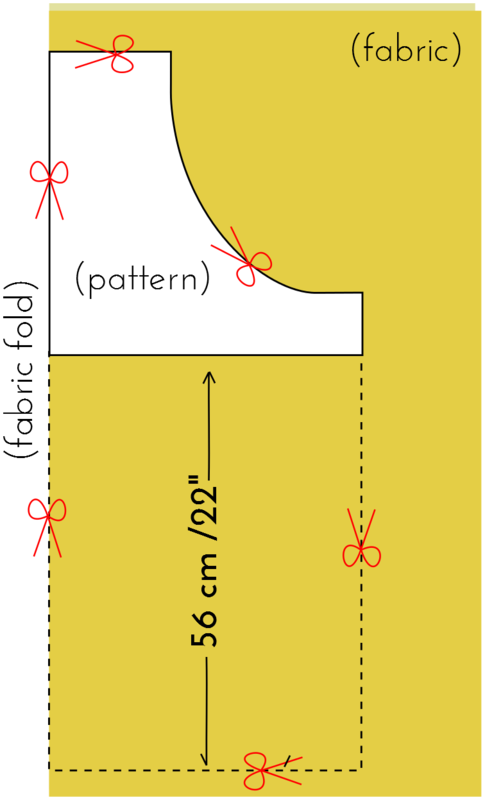 – enough fabric to create 240 cm / 96″ long (see step 7). The patterns can be downloaded here. It is an 8-page pdf file which contains the pattern for the adult apron (p. 1-4) and the kids apron (p. 5-8). Make sure to print at 100% and use the test squares on the first and last page to check whether your printed correctly. Pin the two yokes with right sides together. Set your stitch length to almost the maximum (e.g., 5 out of 6) and baste the outer rounded edge with a 1 cm (3/8″) seam allowance. With the tip of your iron, press open the seam allowance. It’s easiest to do this at the round edge of your ironing board. Remove the basting thread, and give both pieces another good press. Admire the perfectly 1 cm (3/8″) seam allowance you created this way. 2. Set your stitch length back to normal length. Fold the top edge of your main piece over to the wrong side by 1 cm (3/8″) and press. Fold over to the wrong side by another 2,5 cm (1″) and press. 3. Repeat step 2 for the sides of your main piece, and finally, the bottom hem. Stitch all four hems. 4. Take your yokes, and fold each end in by 2,5 cm (1″). Press, but don’t stitch. 5. Put the yokes on top of the arm scyes of the main piece, with right sides together. Make sure you do not turn them upside down (see ‘mark this end’ instruction on the yoke pattern), because then, they will not fit perfectly. Stitch the inner edge with a 1 cm (3/8″) seam allowance. 6. Flip the yokes over to the wrong side of the main piece, and press so they looks nice and neat. Edge-stitch both yokes so as to create a ‘tunnel’. 7. Now, all which is left to do is making the straps and the pocket. For the big chef apron, you will need a strap of around 240 cm (96″) long, and 2,5 (1″) wide (finished measurements). For the little chef apron, it needs to be about 160 cm (63″) long. You can use store-bought straps, or make it yourself. For the adult version, for instance, I created it by stitching three pieces of 80 x 6,5 cm (31.5″ x 2.5″) wide) with right sides together. This creates a long strap which I folded lengthwise with right sides together. I stitched the three open edges with a 7 mm (1/4″) seam allowance, leaving a turning hole right in the middle of the long edge. I clipped the corners, and turned the strap right side out through the turning hole, using a long stick. I pressed the strap, and closed the turning hole. Next, you can insert the straps through the tunnels with a safety pin. 8. Finally, we need to make the pocket. Fold the two short edges over to the wrong side by 1 centimeter (3/8″) and press. Repeat for the long edges. Finally, fold only the top edge over to the wrong side by 1 centimeter (3/8″) again, and press. Stitch at about 8 mm (1/4″) from the edge. Next, place the pocket piece in the middle of the apron, at a convenient height. Edge stitch the side and bottom edges as illustrated.